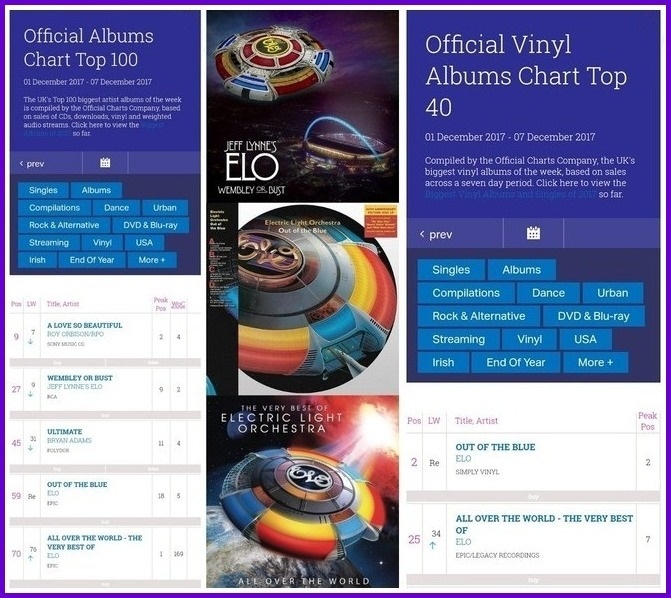 The Official UK Album Chart and Official Vinyl Album Chart published earlier this evening (Friday 1st December) revealed ELO's iconic double album "Out Of The Blue" returning to the Top 100 after a ten year hiatus at #59 on the back of the impressive pre-order sales of the 2LP picture disc set which also saw it soar to #2 in the vinyl chart. It was mixed news elsewhere as "Wembley Or Bust" by Jeff Lynne's ELO slipped eighteen places from #9 to #27 and "All Over The World" climbed from #76 to #70 respectively. Meanwhile, Roy Orbison's "A Love So Beautiful" has clocked up a fourth week in the Top 10 at #9 (down from #7) and Bryan Adams' career compilation "Ultimate" is at #45 (down from #31) meaning that Jeff Lynne has a hand in a quintet of Top 100 albums this week. The 2LP "All Over The World" also jumped from #34 to #25 in the vinyl chart with the 3LP "Wembley Or Bust" dropping out from #7 after a week. 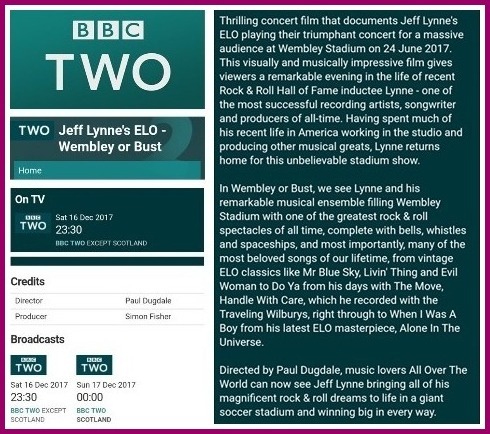 By the way, if you can't get enough of "Wembley Or Bust" digitally or on LP/CD/DVD or Blu-Ray, an edited 75 minute version will be broadcast on BBC2 in just over two weeks time on Saturday 16th December at 11:30PM or from "Midnight Blue" in Scotland (see above for more info). elobeatlesforever (elobf) recommends "Wembley Or Bust" , "Out Of The Blue" and "All Over The World" to those enlightened folks who enjoy the music of ELO, Jeff Lynne, Roy Wood, The Move, The Idle Race, 'Brum Beat', The Beatles and related artistes.